Use this website as a resource for SFFD training and promotions, to help you be more successful on the job, fulfill your career goals, and to make our department a better place (for us and for the public) as a result. LARRO is a 24-hour CA State Fire Training certified course taught in a three-day format. 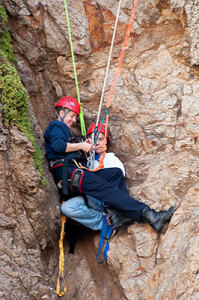 The course provides training for responders in the techniques and methods for using rope, webbing hardware, friction devices and litters in low angle rescue situations. Areas covered include rope and related equipment, anchor systems, safety lines, litter lashing/rigging and mechanical advantage systems. Rescue Systems 1 is a 40-hour CA State Fire Marshal certified course taught in a five-day format. Key topics include: Team organization, rescue, and environmental considerations, use of ropes, knots, rigging and pulley systems, descending, rappelling, and belaying tools and techniques, subsurface rescue techniques, use of cribbing, wedges, cutting and prying tools, use of fire service ladders in specialized rescue situations, rescue exercises.